In 2010 the Amsterdam Centre for Orthodox Theology (ACEOT) was established and inaugurated during a solemn ceremony in main hall of the Vrije Universiteit. 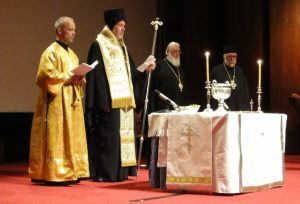 It received the blessing of the Orthodox Episcopal Conference of the Benelux . In 2015 ACEOT was renamed to the Amsterdam Centre for Orthodox Theology (ACOT). It works closely with the Orthodox Church in The Netherlands and the various Oriental Orthodox Churches in The Netherlands. The work of ACOT is supported by a foundation and various sponsors. In August 2015 the Dutch Minister of Education decided to grant VU a special budget for ACOT to educate Orthodox clergy. The foundation aims to establish a scholarship fund for Orthodox students.